Recipe for Fruit Kebabs with Mango Dipping Sauce. Dip them in Mango Dipping Sauce for that healthy but naughty feeling. 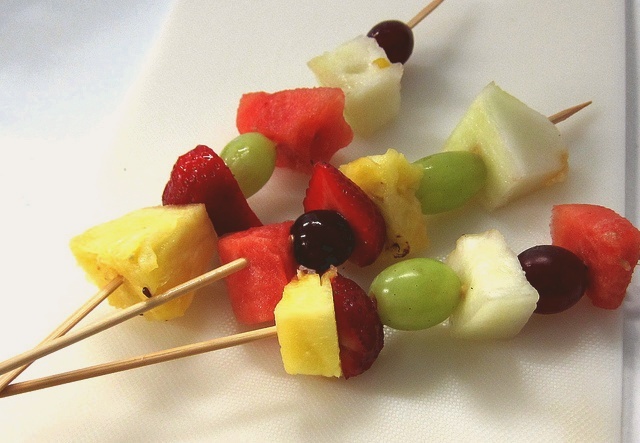 Fruit skewers make an excellent addition to parties, BBQs, wedding receptions, brunches etc. Prepare the fruit by washing the selected fruits. Thread the strawberries, honeydew, watermelon and grapes alternately onto skewers, placing at least 5-6 pieces of fruit on each skewer. Arrange the fruit skewers decoratively on a serving platter. Puree mangoes and yogurt in a food processor or blender until smooth. Transfer puree in a mixing bowl. Add 2 drops of vanilla essence and sugar. Add chopped mint leaves. Mix well. Keep cool in refrigerator before serving with fruit kebabs. Note: Instead of Mango Dipping Sauce, try drizzling melted chocolate over fruit. These fruit kebabs really help children get to like and eat more fruit. great dipping recipe for fruits. i will try it this weekend! thanks! my kids will love this! great idea. tx for the recipe. Thanks for the fruit kebabs and mango dipping sauce recipe. If you don’t mind, can you submit your fruit kebabs and mango dipping sauce photo in http://www.foodporn.net ?